AR: I’m an accidental author. I was happily pursuing a career as a doctor and a parent when I was bitten by the writing bug. Nothing would have happened with it if it weren’t for the internet providing an audience for my early scribblings. Writing was a fortunate discovery for me because I have poor physical stamina from lupus, and it keeps me entertained when I need to be resting. I live in Wisconsin, but my favorite place is Cape Cod, which is where I set my modern novel, The Man Who Loved Pride & Prejudice. Your newest book is called Mr. Darcy’s Obsession; can you tell me what it is about? AR: It’s a twist on Pride and Prejudice in which Mr. Bennet dies, leaving Elizabeth and her family impoverished. Darcy tries to forget her because she is now so far beneath him, but he can’t stay away from her. Meantime, he is disillusioned by the amoral behavior of his extended family, especially his uncle who feels he should take Elizabeth as a mistress, and he starts to recognize the suffering of the poor around him. Combined with his distress over Elizabeth’s reduced circumstances, he realizes that much of his pride in his position is misplaced and he can’t go on without Elizabeth. AR: Except for my modern novel, all of them are Regency era variations on Pride and Prejudice in which change one event from P&P and see how the story plays out. In To Conquer Mr. Darcy, Darcy decides to woo Elizabeth after her first refusal rather than let her go. In Without Reserve, Elizabeth becomes engaged to a childhood friend for the sake of her family, and Darcy must win her back. My favorite change is in What Would Mr. Darcy Do? In that, when Darcy comes to see Elizabeth at the Lambton Inn after her discovery of Lydia’s elopement, instead of leaving her with a long, silent look, he tells her how he feels about her. AR: Desperation! I was having a great time reading Austen-related stories on line, and one day I ran out of new ones to read. What was there to do but to write one myself? AR: I’m putting finishing touches on a new P&P variation, and I’ve started a sequel to Mr. Darcy’s Obsession. I’m hoping to finally get my second modern novel out there as well! What kinds of books do you read? Any favorite authors? AR: I’m a very eclectic reader. I like romance, classics, historical fiction, fantasy, science fiction – anything that captures and holds my interest. My favorite author this week would probably Georgette Heyer. AR: Write the book that is in your heart. Don’t try to write for the market or to catch an agent’s interest. The book that you’re passionate about will be your best. Your favorite Jane Austen hero? If you had a time-machine then to which era would you go, and what would you do? AR: 12th century Kiev. Bet you weren’t expecting that! I’d love to see an early medieval culture where literacy was high and women had legal rights. Sounds like something in a novel, doesn’t it? B: I can honestly say that I did not expect that, but it sure sounds interesting. Thanks to Sourcebooks I got 2 copies of Mr Darcy's Obsession to give away. 1. US and Canada only. In this Pride and Prejudice variation, Elizabeth is called away before Darcy proposes for the first time and Darcy decides to find a more suitable wife. But when Darcy encounters Elizabeth living in London after the death of her father, he can’t fight his desire to see and speak with her again…and again and again. But now that her circumstances have made her even more unsuitable, will Darcy be able to let go of all his long held pride to marry a woman who, though she is beneath his station, is the only woman capable of winning his heart? Abigail Reynolds is a physician and a lifelong Jane Austen enthusiast. She began writing the Pride and Prejudice Variations series in 2001, and encouragement from fellow Austen fans convinced her to continue asking “What if…?” She lives with her husband and two teenage children in Madison, Wisconsin. For more information, please visit http://www.pemberleyvariations.com/ or http://www.austenauthors.com/. This book sounds wonderful! Would love to read it! Great interview, very enjoyable to read! I'm not entering, I'm from Europe. I loved her contemporary Austen retelling - THE MAN WHO LOVED PRIDE AND PREJUDICE! I'd be interested in seeing how her twists on P&P would be. Great interview, ladies. Most definitely did not expect the time travel answer! I cannot wait for the sequel to Mr. Darcy's Obsession. I hope we will see Aunt Augusta again, she was a hoot! First, Kiev, yes I do like the sound of that. And secondly..
Any hints on what that new PP variation is about? I love Pride and Prejudice. This sounds like a fun twist. that's great advice for writers! I've read Pride & Prejudice but thus far, I still haven't read any remake of the original. This book sounds really fun though! Btw, you've been tagged on my blog. Just head over there for details! Unfortunately I can't enter this giveaway but it sounds like a good book. Great interview! Great interview. Don't enter me in the giveaway because I already purchased the book and read it when you were talking about it on Twitter! LOL! It was a great read BTW. Not entering, but I'll mention it! I really would love to read this one. It sounds so good. I am dying to read this novel! I love the unique twist in Darcy & Elizabeth's situation. I love that she decided to write a book because she ran out of things to read - I wish I was that smart! I like her!! and I've enjoyed her variations very much and am thrilled that she stumbled into writing!!! No. Definitely wasn't expecting the 12th century Kiev answer, but how interesting! The Dark Ages and Enlightenment periods have always been interesting periods for me to read about. The conflicts and growth during these times is so interesting from a historical perspective. The book sounds really interesting and I'd love to read it! Great interview. P&P is my favorite Austen, and I do enjoy a nice spinoff. A great interview! Thanks for sharing. 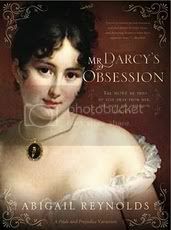 I'd love to read Mr Darcy's Obsession. Lovely interview and I am checking out 12th c Kiev. What's so interesting there? Interesting life path, but things happen for a reason don't they? Congrats and good luck in your future endeavors. Linda, LOVE the new header. It looks fantastic.